Happy New Year From The Amish Catholic! Thus concludes Anno Domini MMXVIII. I hope all my readers had a very fruitful year, and I pray for them all to know many blessings in this coming one. I have a lot to be grateful for this year. I made so many wonderful friends, both via this blog and otherwise. You know who you are. My work seems to be progressing well enough. And I was published in First Things, Jesus The Imagination, and The Church Times. This blog received its 100,000th view. So the year was full of activity. I also feel that I gained more insight into who I am as a person. I’d like to think that in some ways, at least, I’ve become a more self-aware and honest man, and that I’ve learned a little bit more about humility this year. I encountered God in new ways at different points of the liturgical year and in various holy places. I befriended new saints. For all this, I am profoundly grateful. Incidentally, my main New Year’s resolution for 2019 remains the same as it was in 2018. I don’t know if I lived up to it very well this past year, but I shall strive to do so in the next. Perhaps the most ubiquitous tradition of Christmas in America is decorating a Christmas tree. Whether live or artificial, green or white, festooned in tinsel or bedecked with bells, the Christmas tree is the image that adorns all our houses and heralds the coming of the Yuletide. And not just the houses of Christians. Many who celebrate Christmas as a merely secular holiday will still put up a tree. It just wouldn’t really feel like Christmas without it. Yet the Christian discerns in this symbol something more than just a festive sign of the season. First, a short excursus about symbols in general. Metaphor opens the speaker to the experience of “augmented reality,” though not at all in the way that phrase has come to be understood in the world of cheap tricks and tacky technology. Pokemon Go is not a metaphor. It’s just an add-on. It discerns nothing essential and establishes no real connections between unlike objects. Metaphor can. The truer the metaphor, the firmer the connection. It’s a dialectical process. Or, if you like a Trinitarian one: two unlike things are drawn together by the speaker, thus forming an entirely new third. The Sophianic potential of language lies in metaphor. Name and metaphor permit us to imprint, image, and discern a level of reality beyond the merely immediate and sensible. That is why metaphor is impossible in the face of the Beatific Vision. All words die away, since the soul experiences the most heightened level of reality – Being itself. Sophianic vision relies upon this kind of metaphorical thinking. Without dissolving the dogmas of the faith, Sophiology reads them sideways so as to gain an insight into the mystical realities more properly understood via poetry than, say, the logical language of the manuals. American Sophiologist Dr. Michael Martin has called for a “poetic metaphysics” by which we more potently discern the presence of God in His Wisdom, seen throughout Creation. What would this “poetic metaphysics” look like beyond textual confines? That is, what would it look like if people actually lived out this search for the Wisdom of God? Nothing is more weak and powerless than a spider. It has no possessions, makes no journeys overseas, does not engage in litigation, does not grow angry, and amasses no savings. Its life is marked by complete gentleness, self-restraint and ex­treme stillness. It does not meddle in the affairs of others, but minds its own business; calmly and quietly it gets on with its own work. To those who love idleness it says, in effect : ‘If anyone refuses to work, he should have nothing to eat’ (2 Thess. 3 : 1o). The spider is far more silent than Pythagoras, whom the ancient Greeks admired more than any other philosopher because of the control that he exercised over his tongue. Although Pythagoras did not talk with everyone, yet he did speak occasionally in secret with his closest friends; and often he lavished nonsensical remarks on oxen and eagles. He abstained altogether from wine and drank only water. The spider, however, achieves more than Pythagoras: it never utters a single word, and abstains from water as well as from wine. Living in this quiet fashion, humble and weak, never going outside or wandering about according to its fancy, always hard at work – nothing could be more lowly than the spider. Nevertheless the Lord, ‘who dwells on high but sees what is lowly’ (Ps . 1 1 3 : 5-6 . LXX), extends His providence even to the spider, sending it food every day, and causing tiny insects to fall into its web. When carefully fostered in the soul – usually by ascetic rigors and conscious efforts of love – it ceases to be merely Sophianic and takes on an iconographic character, such that everything in our field of sensible experience becomes a symbol of union with the higher realm it represents. Namely, God. Thus can we preserve the presence of God in our waking hours out of prayer. So what does this have to do with Christmas trees? The decoration of a Christmas tree is, in a certain sense, a concrete realization of this process. Bringing a part of the natural world into our home imprints something of the human and thus of the spiritual. We can see this with animals who have been domesticated. Cats and dogs become part of the family. We discern their personalities. They are not just “dog” but “Buster” or “Gabby.” Thus, name and metaphor go hand in hand in elevating the merely natural to something approximating the human. In other words, the power of metaphor allows us to experience the tree as something more than what it is at the purely material level. 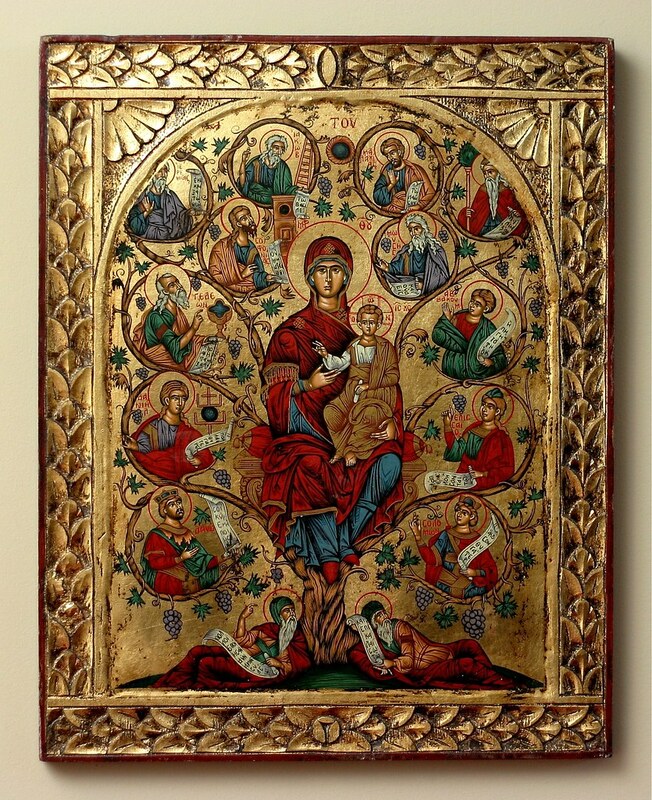 It becomes for us an icon of Holy Wisdom, of Christ abiding in His redeemed Creation. I am reminded of today’s O Antiphon. O Sapientia, quae ex ore Altissimi prodiisti,attingens a fine usque ad finem, fortiter suaviterque disponens omnia: veni ad docendum nos viam prudentiae. -O Antiphon for 17 Dec. These words are manifested in so many ways throughout time and space. They don’t just belong to Advent. Yet the Christmas Tree can (if we come to it with a Sophianic imagination) serve as one meditative example of Wisdom “sweetly ordering all things” in this holy season. It’s no surprise that Archpriest Sergius Bulgakov wrote favorably of the Christmas Tree. *I realize of course that not all families use real trees, and that they don’t all place a Nativity under it. But even here, the power of metaphor enters in. In calling an assemblage of wire or aluminum or plastic a “tree,” we are already entering into the world of metaphor and artifice. In that case, we are only one degree removed from what I have described above. 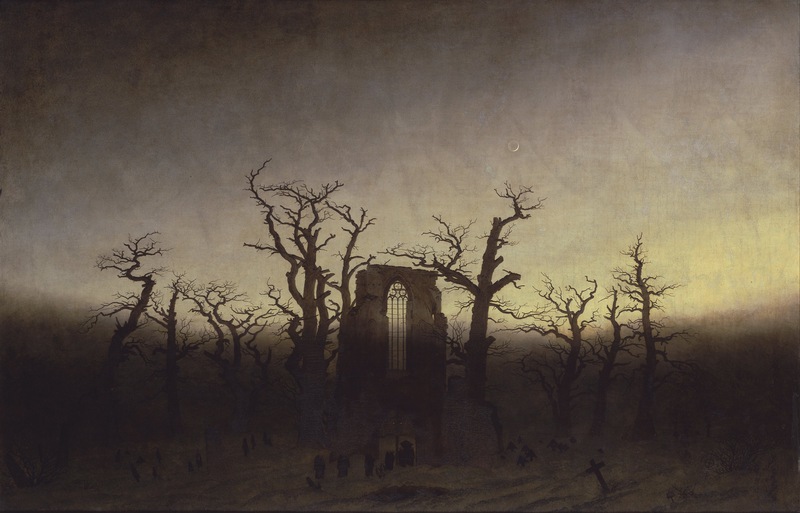 The Abbey in the Oakwood, by Caspar David Friedrich. The Church Times have just published an article in which I summarize some of my research on the connection of Anglo-Catholics and the occult world. I’d like to thank my supervisor, Dr. Sarah Apetrei, and co-supervisor, the Rev. Canon Robin Ward, for their support throughout all of this. I’d also like to thank Fr. James Lawson for the early help he provided as well as Dr. Michael Yelton and those various other figures who have discussed the matter with me over the past year, often in words of encouragement. Hopefully the full paper will be published someday. For now, read here. I confess, I had meant to get this post out earlier. The end of term was hectic and the start of vacation distracting. So here I am, offering my thoughts on Advent reading when the season is already here and nearly halfway done. Still, we can begin to read true and edifying things on any day, especially in the a holy time set apart by the Church for reflection and contemplation of Our Lord in one of His cardinal mysteries. So I offer here a few reading ideas for those looking for a spiritual boost this winter. This meditative book is the sort of thing you’ll want to take to Adoration. Written by an anonymous Benedictine monk, it is jam-packed with consoling thoughts and inspiring messages. The author relates the various locutions from Our Lord and, occasionally, the Virgin and Saints, received in the inward ear of the heart in the course of profound prayer. Over the course of several years’ worth of journal entries, we read of the author’s deep vocation to reparation and adoration for the sanctification of priests. I would recommend this volume to any men considering a vocation of any kind. Its rhythmic, prayerful passages breathe and bristle with a sense of holiness rare among contemporary spiritual authors. The voice of Our Lord sings through it all, not as a trumpet or thunderclap, but as “a whistling of a gentle air” (1 Kings 19:12 DRA). Speaking only as a layman, I can say that this book completely revolutionized my spiritual life. I wonder where I should be now if it had not come into my hands a little over two years ago. This list wouldn’t really be an Amish Catholic post about spiritual authors without some reference to Fr. Faber. The Apostle of London wrote many books about special devotions, graces, and mysteries of Our Lord’s life. 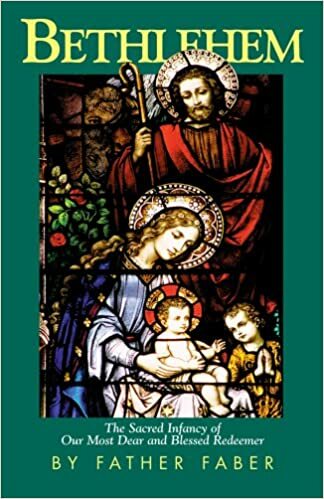 His last volume, Bethlehem, is devoted to the birth and infancy of Jesus, making it especially suited for perusal at this season. Like many of his other texts, Bethlehem is more devotional that practical. It is intended to inspire love for Our Lord under the particular mystery of his Incarnation. While this may be just what you need this Advent (and Christmas), you may desire something a bit more practical. How to grow in the practice of the love of Jesus? How to keep on in the unflagging task of Christian charity at a time so full of worldly distractions and weariness? How do we live out the Incarnation in our own lives? If this is the sort of thing you’d prefer in your Advent reading, then perhaps turn to Fr. Faber’s first great devotional work, All For Jesus, or the Easy Ways of Divine Love. In this great volume, it is Fr. Faber’s task to kindle the zeal of his readers by demonstrating the sheer ease of love. He points to concrete, simple practices by which to further what he calls “the Interests of Jesus,” to save other souls, and to sanctify our own. All For Jesus is my main spiritual reading this Advent, and I have already found it working marvels. If you would love God with warmer enthusiasm and brighter joy, then read Fr. Faber! 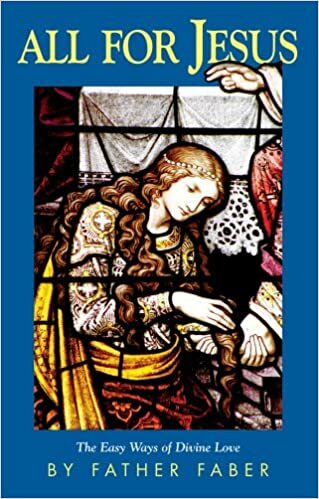 You can find Boris Jakim’s translation of “A Short Tale About the Antichrist” in the collection Sophia, God, & A Short Tale About the Antichrist. (Source). This short story by Vladimir Solovyov, the “Russian Newman,” may seem like an odd choice for Advent. Yet Advent is the apocalyptic season par excellence. The liturgy turns our ears to the voices of the prophets and our eyes towards the visions of the Last Day. And so it can be helpful to think creatively about what the end will be like. I don’t believe Solovyov envisioned his (in some ways, rather prescient) tale of the future to be a literal prediction of what would happen. The man was not a fundamentalist, and this is not Left Behind. But he did see it as his spiritual last will and testament. The story is a powerful meditation on the nature of real evil, real Christian love, and what Christians will have to stand for in their last and terrible hour. An edifying read, for sure. If you like your apocalypse unalloyed, then open your Bible, sit down, and read the entire Book of Revelation in one or two sittings. That may seem like a lot, but it brings lots of rewards. We often lose sight of the unity of the Bible’s individual books when we just pick at passages here and there. Reading the text fully through can help restore our vision of each book as what it is – an integral whole. With a book as symbol-laden as Revelation, that reclamation becomes even more important. It is a holy and pious thing to meditate on the Second Coming of Our Lord in Advent. Reading the Apocalypse nourishes the soul’s sense of expectation and, indeed, her desire for the final judgment. The pious soul who seeks to be immersed in the text’s sapiential logic will gain many fruits. Those who go into it with only a narrow literalism will find nothing but an arid maze. This truth applies to all of Scripture, but most especially to its apocalyptic passages. So, those are just five options for Advent reading. There are probably hundreds of other texts I could have chosen; thus we come one example of the great diversity that characterizes the true mind of the Church.